Holy crap it’s finally here! Baseball season is officially starting to brew. It is always the first real sign that winter is on it’s way out. As I have done the last couple years I will make a spring training set of the Royals players in camp based on the new 2013 Topps design. It is always a daunting but fun project. I love seeing the first glimpse of a player in their new uniform, especially Royals players. 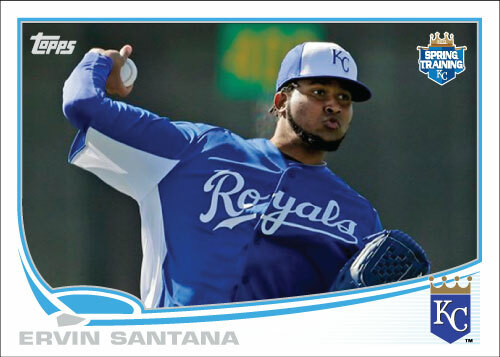 I’m starting out of the gate with a big one, your first look at a baseball card of Ervin Santana as a member of the Kansas City Royals and your first look at the 2013 Topps spring training card design. Enjoy!